Drum Corps International will once again team up with National Cinemedia's Fathom Events for the Drum Corps at the Movies: Tour Premiere, and those looking to find out more can visit DCI2012OnTheBigScreen.com. Visitors to the website can learn more about the Tour Premiere, buy tickets and find participating theaters. Web banners are available to help fans spread the word, and the website even provides templates for tweets, Facebook posts and newsletters about the event. 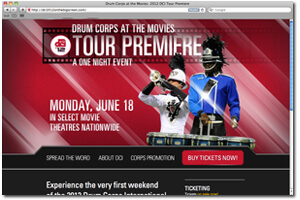 On Monday, June 18 at 6:30 p.m. (local time), the Tour Premiere will give fans the ability to watch performances from the kickoff event of the 2012 DCI Tour in Akron, Ohio from the comfort of movie theaters nationwide. The event will feature six of last year's top 12 corps from the DCI World Championships including the Blue Stars, Phantom Regiment, The Cadets, Carolina Crown, Bluecoats and The Cavaliers. Two months later, on Thursday, Aug. 9 at 6:30 p.m. (ET), fans can also take part in DCI's Big, Loud & Live cinecast, featuring a high definition broadcast of the 2012 World Championship Prelims in Indianapolis. Spread the word at DCI2012OnTheBigScreen.com today.